They say the only way to truly understand the Caterham Seven is to drive it - and now there's more opportunity than ever before to enjoy the rest of the summer holiday season in style without breaking the bank. Caterham's legendary Seven sportscar is now available for hire from eight locations, with a number of new Roadsport models joining the fleet. Ideal as an extended test drive or short break away, the Hire-A-7 service enables drivers to take in the unique sensation of piloting a lightweight, open-topped sportscar, famed for its intuitive handling characteristics, on their favourite A and B-roads. With low weekday rates and discounts for weekend hire, the ultimate 'race car for the road' can be experienced for little more than the cost of hiring a regular car, with prices starting from £175 a day. Caterham South, Surrey; Caterham Midlands, Leicester; Open Road Hire, Scottish Highlands; Mark on Europe, Swindon; Seven Hire, Gloucestershire. Most recently, Roadsport Hire in Yorkshire, Highlands Caterham Hire in Scotland and Hire 7, Northern Ireland, have joined the initiative. Most Hire-A-7 vehicles are Roadsport-spec models, meaning there's enough comfort for long-distance excursions and weather protection should the elements decide to turn. With its distinctive handling characteristics, the Caterham Seven is unlike anything else on the road. Its direct, race-inspired steering, alert throttle response and astonishing manoeuvrability unite to provide an unrivalled driver experience. Priced from £175 for one day's hire (including 120 free miles) or £325 for two days (including 240 free miles), vehicles can also be loaned from Friday to Monday. 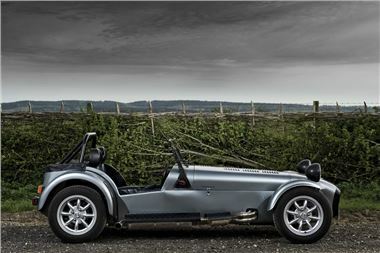 Please visit http://www.caterham.co.uk for more information.